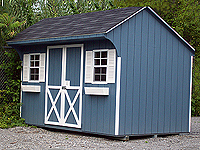 The finest Amish Sheds & Buildings for your Yard and Garden! J&G Farms Sheds, Barns, and Buildings are the perfect solution to all your storage needs. 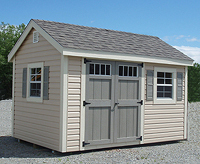 From Garden Sheds for outdoor tools and equipment to Garages for cars or boats, we carry it all. We also have a wide selection of Gazebos, Pool Houses and Carriage Houses that enhance your property while offering functionality. 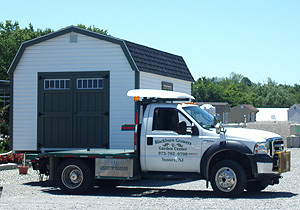 As one of the largest shed dealers in north Jersey, we offer quality buildings in a wide variety of sizes - from 6' x 8' up to 14' x 32'. The 15 color choices ensure that you can choose a color for your building that will compliment your home. A shed or out-building from J&G Farms is sure to help you organize your tools, your leisure, and your life by creating more storage space in your yard or garden. 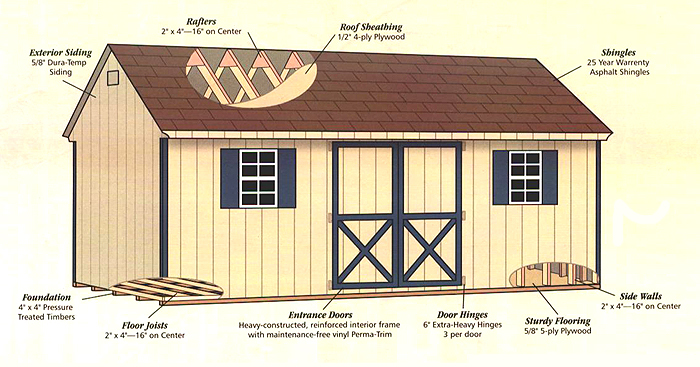 Our buildings and barns are manufactured in Lancaster, PA by Amish carpenters. Our builders chose only the finest building materials for shed construction. The manufacturing process maximizes the efficient use of quality lumber with minimal waste. The Amish craftsmen build for quality and consistency. At J&G Farms, we believe in value! Our quality buildings are reasonably priced as a result of quantity buying and prudent manufacturing. We stand firm on our commitment to quality and value, and we have sold hundreds of buildings and barns to satisfied customers. Our manufacturers continuously improve our buildings and construction techniques, bringing you unsurpassed value. Your choice of one of our buildings brings with it a host of options, allowing you to customize your building for your unique needs, personal preferences, and lifestyle. In addition to size and style choices, we also offer a multitude of color, construction, and decorative options. The area must be firm, flat and level. A base of 3/4" crushed stone 4 inches deep is preferable. Another option is a concrete slab. Your site should allow sufficient access for delivery truck and trailer. J&G Farms delivers sheds and buildings to all of New Jersey. Delivery charges generally range from $100-$350, depending on your location. We'll be happy to provide an estimated delivery cost. Our delivery truck and trailer are able to reach remote areas and travel over rough terrain, as long as there are no major obstacles in the road or pathway. Please check with your local municipality to determine if a Building Permit is required in your city or town.